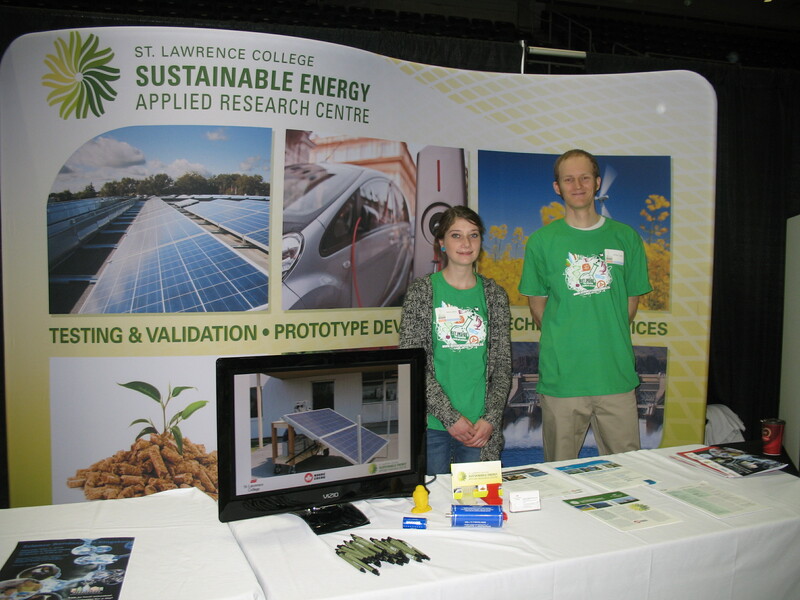 SEARC Student Research Assistants Molli Smith and Michael Clarke along with Principal Investigator Gordon McAlary participated in the Science Rendezvous Kingston 2014 event on Saturday May 3rd. Science Rendezvous was held at Rogers K-Rock Centre in Kingston. Science Rendezvous is an annual event coordinated by the Queen’s University Community Outreach Centre. The event showcased the work of local science, engineering, technology and math programs and related initiatives in the Kingston community. The main objective was to inspire young children to become interested in science and math activities. Over 3700 children, parents, and other interested individuals came through the K-Rock Centre during the 6 hour event. SEARC SRAs had many discussions with teens and adults about SLC, the many research opportunities available to Applied Science and Computing students, and energy issues in general. St. Lawrence College had a large contingent attending the event this year. Along with SEARC, Control Engineering Technology (CET) faculty Jason Murduck and Rob Woudsma demonstrated “Smartie” the robot to many on-lookers. CET graduate Robin Penrose demonstrated his automated writing machine, designed and built for one of his classes. The Energy Systems Engineering Technology (ESET) was represented by faculty members Ian Kilborn and Steve Lapp. ESET student Marc Moraze assisted with the ESET booth. Children were especially attracted to the interactive bicycle system which demonstrated thermoelectric cooling. The ESET heating, ventilation and air conditioning (HVAC) demonstrator rig provided a colorful backdrop to the booth.